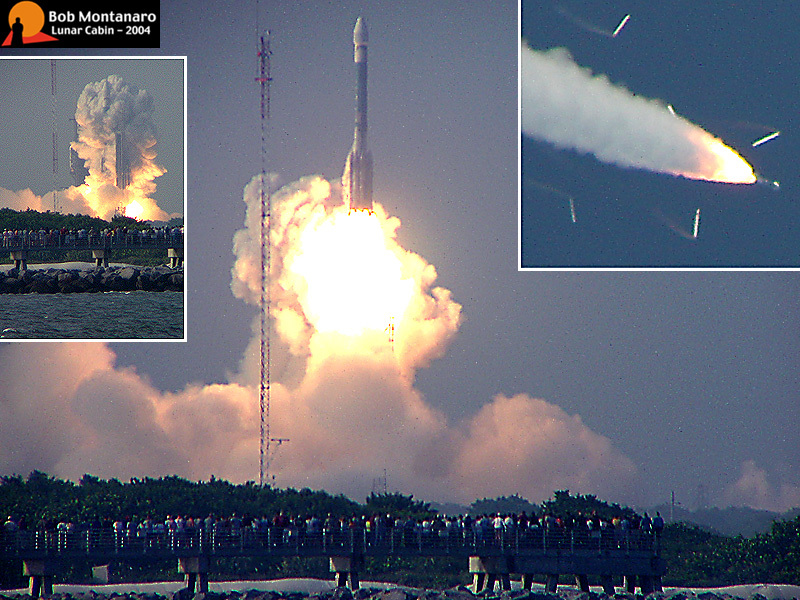 A crowd watches the Delta 2 rocket lifting a Global Positioning Satellite, GPS 2R-12, into hazy skies on 23 June 2004 at 6:54 p.m. from Cape Canaveral Air Force Station. Plagued by technical delays and multiple launch scrubs due to days of bad weather, many people doubted this rocket would ever get off the ground. Affixed to the launch tower in memory of the late president is a sign reading “Ronald Reagan: Launch One For ‘The Gipper’ 1911-2004.” The left inset image shows the moment of ignition while the right inset image shows the ground lit solid rocket boosters being jettisoned.